The people of Kingston, Ontario, have always held Sir John A. Macdonald close to their hearts. He arrived on the point where Lake Ontario feeds into the St. Lawrence River when he was a small boy. The small city was noted for its strategic importance in the continuing hostility between the British North American colonies and the United States. Both he and the city prospered and grew in stature. Shortly after Macdonald began practicing law, Kingston became the first capital of the United Provinces of Canada. 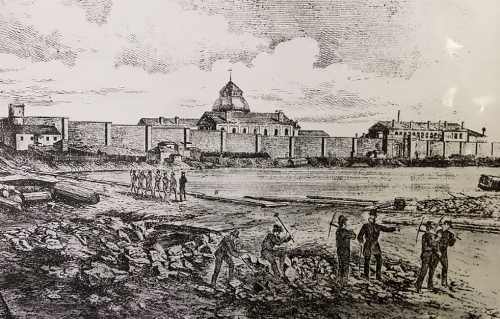 As the elected representative for Kingston, Macdonald fought hard for his constituents and ensured that the city got its share of government projects -- including the penitentiary that is today a major tourism attraction. 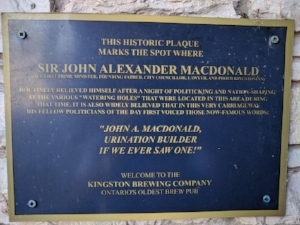 And over the decades, the strong support of Kingston's voters gave Macdonald the political base he needed to become one of the outstanding nation-builders of the 19th century -- up there with Disraeli, Bismark, Lincoln, Gladstone and Cavour. The city has been justifiably proud of him. The main road into the city is the Sir John A. Macdonald Boulevard. The CPR locomotive named in his honour has pride of place in the heart of the city. The building where he first practiced law has been preserved. 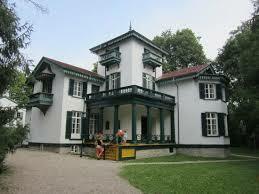 Bellevue House National Historic Site, where he took care of his invalid wife draws visitors from around the world. The wits of the city even like to joke about how the fellowship and likeability that made him such a consensus-builder may have been well lubricated in the tavern of Kingston -- and relieved in the nearby alleyways. But in recent years, Sir John A. 's legacy has been questioned. In Victoria, B.C., for example, his statue was recently removed from City Hall. Even in Kingston, his statue has been defaced. A popular downtown pub occupied the building where Macdonald had his law offices from 1849 to 1860 was named in his honour. Alas, bowing to pressures from local Indigenous groups, the owners changed the name. ...including a bust from the 1880s when he was Prime Minister. The controversy will continue. Indigenous peoples object to Macdonald's role in establishing the young Dominion's policies, including The Indian Act, the withholding of food to force First Nations onto reserves, and setting up the education policies that would eventually lead to abuses at residential schools. 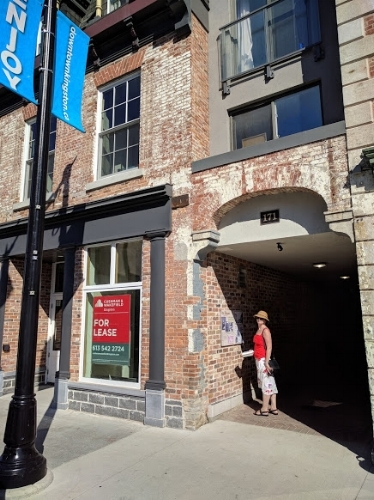 In an effort to get ahead of the issue and provide a forum where different versions of his history can be discussed, the City of Kingston today launched a consultation through its "Get Involved" website. Residents are also invited to bring their comments and suggestions to City Hall. The City Hall building -- one of the masterpieces of pre-Confederation architecture -- was the place where Macdonald's body lay in state after his death in 1891. Some 20,000 people came to pay their respects. The funeral procession then brought his remains to the Cataraqui Cemetery, in the high ground overlooking the town, where the Macdonald family had a plot. The obelisk in the centre of the plot is not in commemoration of Sir John A. -- rather, it marks the family plot. Sir John A. 's own tombstone is modest and unassuming, observing simply that after a life richly lived but when certainly contained its share of personal demons and tragedy, the great statesman is now "At Rest." Given my interest in treason and the legacy of Joe Willcocks, I was very interested in seeing how Thomas D'Arcy McGee would fare on trial before a jury of his... well, not his peers, exactly, given that his jury was very much alive while he, the witnesses, and the court officials were not! 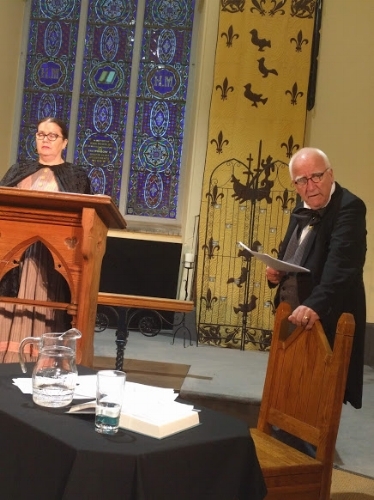 The Trial of D'Arcy McGee, a play by Anthony G. Russell, was performed by the Newpoint Players of Newry, Ireland, as part of the 2018 D'Arcy McGee International Forum in Carlingford, McGee's birthplace. 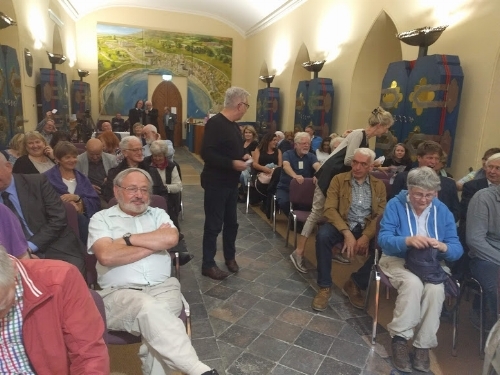 It followed a successful format that Russell had established with The Trial of Padraig Pearse and The Trial of the Orange Order in previous years when the forum was called the D'Arcy McGee Summer School. The format brought McGee back from the dead to account for his betrayal of his early republican ideals of the Young Ireland firebrand 1848, and his urging the death penalty for any Fenian officers captured during the invasion of Canada in 1866. Presiding over the trial was Larry McArdle as Judge Dionysus Cronos, an eternal judge who established that he had been present at the trial of Socrates, and serves in the jurisdiction of The Court Of History. The protocol of an earthly court loosely applies -- with a wonderful addition of references to pop songs and the poetry of Seamus Heaney. 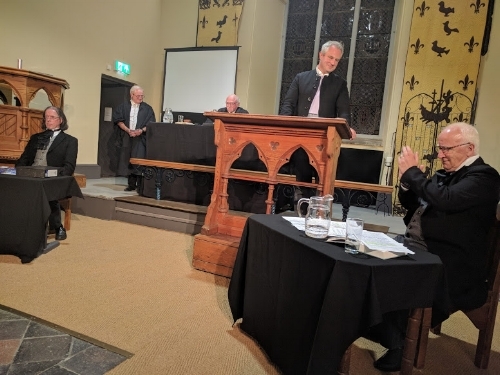 Canadian lawyer Dermot Nolan, author of his own play on the assassination of McGee, It's Morning Now, performed as the barrister for the defence. The long-dead attorney was an individual who, like McGee, had moved on from early Irish radicalism to become an outstanding citizen of the British Empire: Gavan Duffy would go on to become Premier of Victoria, Australia. "Charles Gave-in Duffy," taunted the prosecuting attorney, John Mitchel -- another colleague of McGee from the rebellion days. Unlike McGee and Duffy, however, Mitchel never lost his hatred for the British and eventually became an outspoken supporter of the Confederacy and an upholder of slavery in the United States. Mitchel was played with fierce passion by the play's director, Donal O'Hanlon. The judge gave Duffy and Mitchel considerable leaway to launch ad hominem attacks on each other, giving the "jury" a broad perspective on the growth and evolution of 19th century personalities and politics. Among the witnesses for the prosecution was summoned Sir John A. Macdonald (SJAM). Although he was a close friend and admirer of McGee in real life, SJAM was called upon to establish the evidence that McGee had called for the execution of Fenian leaders -- considered by the prosecution as de facto evidence of his treason. Lowry Hodgett played SJAM as a short-tempered, irascible individual, impatient to get past the Irish backstory and on the the Canadian part of the trial. One of Macdonald's most remarked-upon qualities of his day, however, was his charm and his likability. He became Prime Minister because he was so good at bringing people together around his winning personality. I mention this because Sir John A. is under attack in Canada these days, and it helps us to remember that the founder of Canada's confederation was a man who would be appalled that so many of his intentions are now taken out of context. Last week, his statue was removed from outside the City Hall of Victoria, BC, and the Scottish Government removed reference to him and to Sir John A's Great Canadian Kilt Skate from its website. 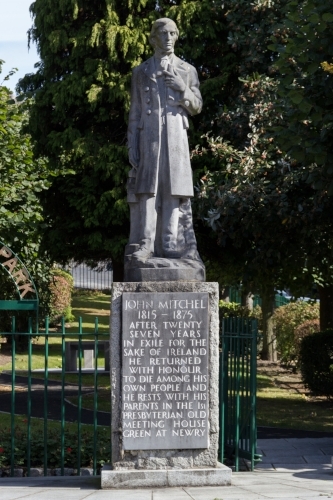 As with SJAM, so John Mitchel's statue in nearby Newry, his hometown, has come under scrutiny as a result of his support for slavery. The chief witness for the defence was D'Arcy McGee's widow, Mary Theresa Caffrey, played by Diane Russell. As a playwright and author, Anthony G. Russell has a particular sensitivity to the women who were the guiding lights behind men who rose to prominence. His biography of John Mitchel, Between Two Flags, highlights the relationship between the Irish firebrand and his wife, Jenny Verner. Mrs. McGee's testimony about the character and integrity of her husband preceded the summations where, once again, Mitchel argued that McGee's erratic and oft-changing position on the key issues of the day culminated in treason to Ireland, while Duffy upheld McGee's sincerity and conviction in seeking the truth even if it meant changing his mind on his past opinions. The verdict was thus left in the hands of the jury -- some 60 members of the audience who were given pieces of paper on which to write "Guilty" or "Not Guilty." 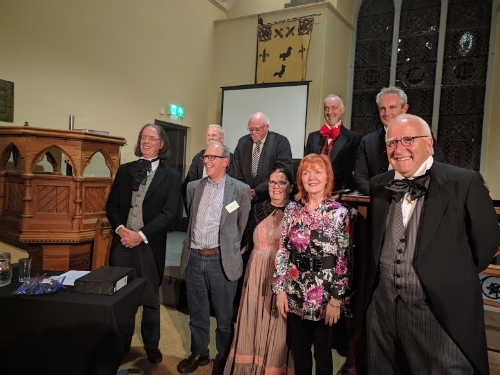 Perhaps it should be no surprise, though, that at an international gathering to consider McGee, his legacy, and the issues of our day, the final count came in with a rounding exoneration: Not Guilty 52; Guilty 2. 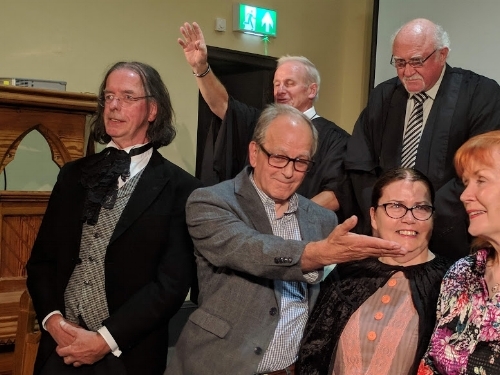 The cast of The Trial of D'Arcy McGee included: McGee- Stephen McCourt; Mrs McGee- Diane Russell; Mitchel- Donal O’Hanlon; Gavan Duffy- Dermot Nolan; Sir John A- Lowry Hodgett; Judge- Larry McArdle; Clerk- Tommy Fegan; Jury Chairperson- Tom Kelly; Singer- Anne Tracey; Author- Anthony Russell; Director- Donal O'Hanlon. To celebrate his acquittal and to enjoy an evening of music and craic, cast and audience repaired to the Carlingford Arms pub where, much as McGee would have done, the revelries lasted long into the night. And yet... and yet... when we look at the issues of D'Arcy McGee's time -- the issues that wracked Ireland and threatened to throttle Canada's Confederation while it was still in the cradle -- we can see that the problems are resolvable and reconciliation is indeed possible. When we look at how far Ireland has come in its own journey of reconciliation since the civil war nearly a century ago and The Troubles only 20 years past, we have profound examples of reconciliation. The Scottish government has moved to distance itself from the Glasgow-born father of the Canadian nation over his treatment of its indigenous population. A bronze statue of Sir John A Macdonald, Canada’s first prime minister, was toppled in Victoria, British Columbia, last Saturday after officials said it was a “painful reminder of colonial violence”…Since 2015 the anniversary of his birthday has been celebrated by Sir John A’s Great Canadian Kilt Skate. The Scottish government has been the main sponsor of the annual event, at which Canadian-Scots take to the ice in seven cities wearing tartan and waving saltires attached to ice hockey sticks. We reshape the stories to suit our desired narratives. In the 1880s, both the young nation of Canada and the first stirrings of the women's movement required a heroine and Laura Secord became the focal point of the story of Beaverdams -- and the War of 1812. In 2018, First Nations are reasserting their place in how we explain our history, so Laura Secord may eventually become less central to the battle than the determination and resourcefulness of the warriors who inflicted such a decisive defeat on the Americans. On this day, 205 years ago, Upper Canada (now Ontario) was as close as it ever would be to becoming part of the United States. But the night-time battle fought in the early hours of June 6, 1813, was a turning point in the War of 1812. Stoney Creek, Battle of Fort George, John Norton, General Chandler, John Harvey, Niagara-on-the-Lake, Blood Oath, A Hanging Offence, Brothers at War, Joe Willcocks. But on this, my second visit to Kilmainham, my imagination was more occupied with another story from the annals of the prison -- the significance of which I was not aware when I first arrived seven years ago: the fate of Robert Emmet. To wrap up this Canada150 project, Bob Plamondon bridged to our world: one Prime Minister lost in the mists of time, and four others whom some of us remember vividly. What future generations remember will eventually be the gold left behind in the sluice of time. Plamondon himself has participated in that story. He was the Progressive Conservative candidate for Ottawa Centre in the 1988 (free trade) election. 150 Years ago, Fenians murdered Ireland's Gift to Canada. While in Ireland, I sometimes feel I'm on a mission to explain to the Irish the enormous impact of an Irishman his home country has forgotten. No one here has heard of Thomas D'arcy McGee, Canada's most eloquent Father of Confederation, and Ireland's gift to Canada. One of the most important tests of any democracy is how smoothly power can be transferred when governments change. The Dominion of Canada had existed for barely six years when it faced that challenge. The first general election since Confederation turfed out the scandal-ridden regime of Sir John A. Macdonald and brought in a Liberal government no longer led by George Brown, who had guided them in the crucial years leading to Confederation. The challenge of pulling various Liberal factions into a cohesive first Liberal government fell to Brown’s close friend and chief Lieutenant, Alexander Mackenzie – a man who much preferred to follow than lead. “Part of what makes a nation is shared experiences,” Dr. Litt reminded us. The shared experiences of the Trudeau years ranged from the Laporte murder and the War Measures Act, to the highly visible dramas that played out in Trudeau’s personal and family life. He came to office after defeating Sir Wilfrid Laurier’s proposal to implement free trade with the United States, and believed that Canada should take a prominent place in what he foresaw as a great federation of the dominions of the British Empire. By the time he left office, the political landscape and the definition of “progressive” had changed dramatically, with the rise of Labour and Farmers’ organizations that clashed with the government – violently in the case of the Winnipeg General Strike in 1919. When Joe Willcocks left Ireland for Upper Canada in 1799, he said goodbye to the "Second City of the British Empire" to seek his fortune in "Muddy York. "Both Dublin and Toronto are thriving in the 21st century. In Dublin, far more than Toronto, it's still possible to get a feel for the city as it once was. Last week, we had the privilege and pleasure of a barge ride through the transportation system that helped make Dublin such a wealthy city in Willcocks's day.